For our Term 3 Staff Development Day I have been asked to give a session on IWB Tips and Tricks. I reviewed some surveys the Technology Committee asked the staff to complete at the end of Term 1, with my colleague Annie. Annie and I found that many staff were wanting to know how to better organise themselves with all the stuff they were finding on the internet AND how to find good resources. I mentioned to Annie the use of del.icio.us to save, organise and discover favourite websites, and how this could help staff so we decided to run a session introducing staff to del.icio.us. While this isn’t exactly a tip or trick for using the SmartBoard, it should help staff organise and save their websites, which currently can’t be saved in their individual server user accounts for some reason. It should also enable staff to find other good resources and time efficiently. Then split into groups (K-2 & 3-6) for staff to share some websites they’ve found useful and practise bookmarking and tagging them. 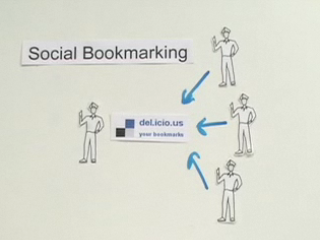 The Video – Social Bookmarking in Plain English, available from CommonCraft or YouTube. A PowerPoint for staff to use, a Poster for staff to display in the classroom, and the icons I used in the PowerPoint and Poster (with thanks to FastIcon and downloaded from here).